Praise Cheezus! 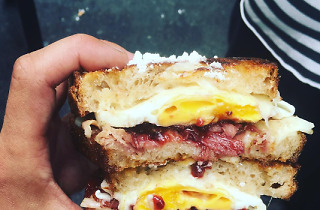 The self-dubbed "designer cheese shop" draws hungry Angelenos with its ultra-cheezy spread of gourmet sammies—from the "Going Jon H.A.M." (gruyere, smoked ham, butter pickles, fresh ground and raw black truffle mustard) to the "Incredible Hulk" (manchego, smoked bacon, avocado, and a fried egg). Mouth watering yet? Same. Let's give a round of applause for the sandwich names alone. 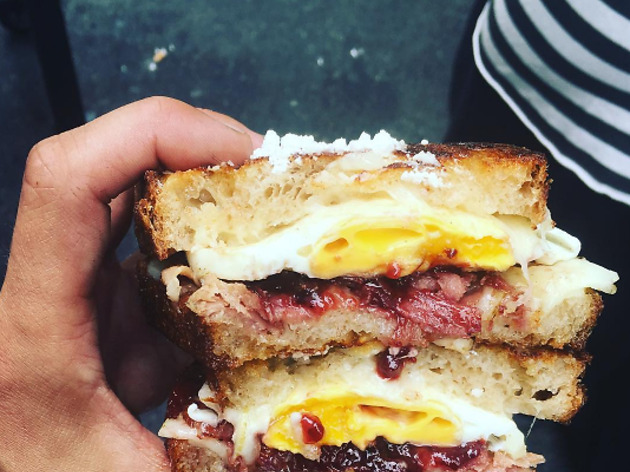 The coveted grilled cheese haven is located inside Downtown L.A.'s beloved food market, Smorgasburg LA, which is sadly only open on Sundays. But we can dream about it the rest of the week, right? Think of it as an oozy weekend treat. Drop by between 10am and 4pm to get your fix. Tip: Order the "Screaming Jesus On a Ferris Wheel" (yes, you read that correctly), which is packed with manchego cheese, grass-fed sausage, non-gmo peppers, local shitake muchrooms and saffron-infused raw honey. Your welcome.